One of my bugbears with many HDTVs is that although they have several SCART sockets which will (hopefully) be all but obsolete in a few years, most of them around the lower end only have a single HDMI port. Not ideal when you have an upscaling DVD player, 360 Elite, PS3, HD set-top box, and the rest. Enter Joytech. I was wary of their HDMI switch after the serious performance problems with their component switchbox (the first version had problems with HD sources, making it all but useless), but for £30 (minus HDMI cables) I thought it was worth the risk. What a fantastic little box! I’m going to have to gush a bit here because, aside from the lack of even one included HDMI and the fact that the blue indicator light is too bright in a dark room (I stuck tape over it to take the edge off), I have no complaints. It does exactly what you want it to – that is, it switches between HDMI sources quickly and is HDCP-compliant – and has a couple of handy touches that make it especially easy to recommend. The first is that in addition to the normal plug, it comes with the option to power it over USB. With so many consoles and modern STBs having USB on the back it can save a valuable slot on the mains. The PS3 doesn’t send power to its USB slots when it’s turned off but the 360 (and HD DVD drive) and Wii both do, as does the Sky HD box, I’m reliably informed. This is an option that more low powered items should have, and in future I want all phones and portable devices to support charging over USB as standard, please. Secondly it comes with an infra-red extension attached to a small box that can be taped to the TV or somewhere discreet. No need to have the box on display in order to change it remotely so it can be safely chucked into the jungle back there where you never have to notice it again. Unless you’re in a dark room, in which case you’ll notice the aforementioned blue glow all the time. The day that electronics companies realise that as cool as blue LEDs look, they’re usually far too bright will be a happy one. Considering that only a year ago you’d be looking at well over £100 for a half-decent HDMI switch this is an absolute steal. Just don’t get suckered into buying overpriced leads (95p through Amazon Marketplace) to go with it. 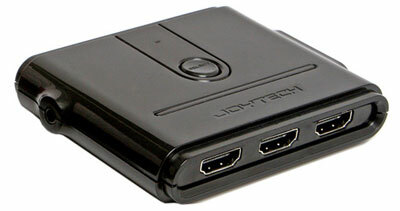 I bought a Joytech HDMI Trilink switch last week, and have been quite disappointed. I have it connected to a Panasonic PT-AX100 projector and two HD inputs: a Toshiba HD-XA1 HD DVD player and a Panasonic DMP-BD10 Blu-ray player. Although it says it is HDCP compliant, neither will work through this switcher. All I see is a green screen, regardless of the order I switch each device on. Very disappointing! That’s strange. It seems like you just got a dud one because mine’s still going strong with the PS3 and a Toshiba HD-E1 (both HDCP) running through it.